240 pages | 1 B/W Illus. This book explores the hopeful possibility that emerging geographies of postsecularity are able to contribute significantly to the understanding of how common life may be shared, and how caring for the common goods of social justice, well-being, equality, solidarity and respect for difference may be imagined and practiced. 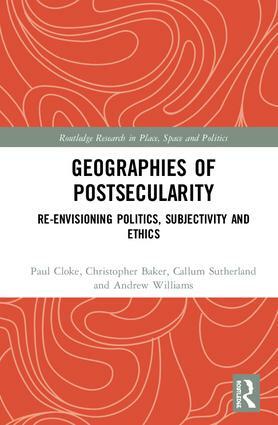 Drawing on recent geographic theory to recalibrate ideas of the postsecular public sphere, the authors develop the case for postsecularity as a condition of being that is characterised by practices of receptive generosity, rapprochement between religious and secular ethics, and a hopeful re-enchantment and re-shaping of desire towards common life. The authors highlight the contested formation of ethical subjectivity under neoliberalism and the emergence of postsecularity within this process as an ethically-attuned politics which changes relations between religion and secularity and animates novel, hopeful imaginations, subjectivities, and praxes as alternatives to neoliberal norms. The spaces and subjectivities of emergent postsecularity are examined through a series of innovative case studies, including food banks, drug and alcohol treatment, refugee humanitarian activism in Calais, homeless participatory art projects, community responses to the Christchurch earthquakes in New Zealand, amongst others. The book also traces the global conditions for postsecularity beyond the Western and predominantly Christian-secular nexus of engagement. This is a valuable resource for students in several academic disciplines, including geography, sociology, politics, religious studies, international development and anthropology. It will be of great interest to secular and faith-based practitioners working in religion, spirituality, politics or more widely in public policy, urban planning and community development. Paul Cloke is Professor of Human Geography at the University of Exeter. He has longstanding research interests in the geographies of social marginalisation and exclusion, and in the political and ethical responses from Third Sector organisations to issues of social care and justice. His recent books include Swept Up Lives (with J May and S Johnsen; Wiley-Blackwell 2010); FBOs and Exclusion in European Cities (with J Beaumont; Policy Press 2012); and Working Faith (with J Beaumont and A Williams; Paternoster 2013). Christopher Baker is William Temple Professor of Religion and Public Life at Goldsmiths, University of London, where he co-directs the Faiths and Civil Society Unit. His publications engage theology and religious studies with sociology, sociology of religion, human geography, planning, and policy studies. His edited volume Postsecular Cities: Space, Theory and Practice (with J. Beaumont; Continuum 2011) is a much-cited and authoritative text in this field. Callum Sutherland is a Human Geographer based at the University of Exeter. His published work examines themes of religion, politics, and spiritual activism, with particular regard to Christian praxis and social justice. Andrew Williams is Lecturer in Human Geography, Cardiff University, and specialises in questions of ethics, welfare, and politics. His latest books include Working Faith: Faith-Based Organisations and Urban Social Justice (with P Cloke and J Beaumont; Paternoster 2013) and Feeding Austerity? Ethical Ambiguity and Political Possibilities in UK Foodbanks (with L Cherry, P Cloke, and J May; Wiley-Blackwell, forthcoming).